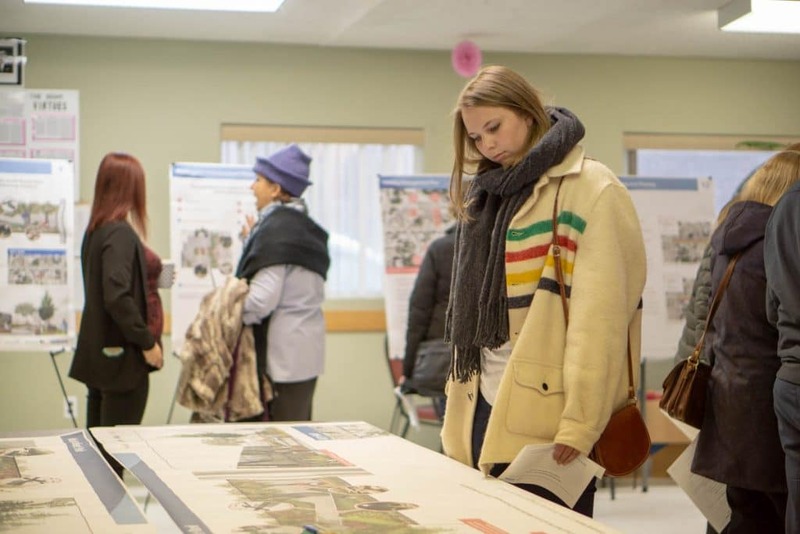 When Jeannie Red Eagle saw the storyboards and design for the redevelopment of Manitoba Avenue East at the April 4 open house at Gordon Howard Centre, she saw many things, but mostly she saw potential. Red Eagle, who’s called Selkirk home since 2003, said she loves the plans to recreate the avenue into a pedestrian friendly destination and she really likes the idea of having a couple of pocket parks along the way. She caught the ear of Selkirk CAO Duane Nicol and suggested to him one of the parks could contain elements of a healing garden, an idea she came up with after providing testimony at the National Inquiry into Missing and Murdered Indigenous Women and Girls. “I wanted to get something firm in place, something like a healing garden,” Red Eagle, an Indigenous woman, said. 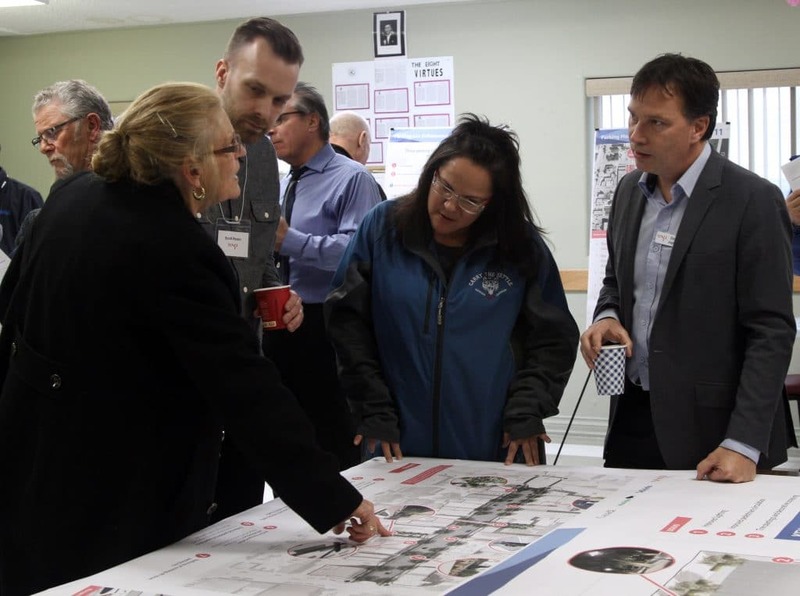 Nicol was impressed with Red Eagle’s suggestion, and said that’s the purpose of engaging the public and it’s why the city hosts open houses and invites people into the process. “When we do public engagement, it can give the city ideas it hadn’t thought of,” Nicol said. 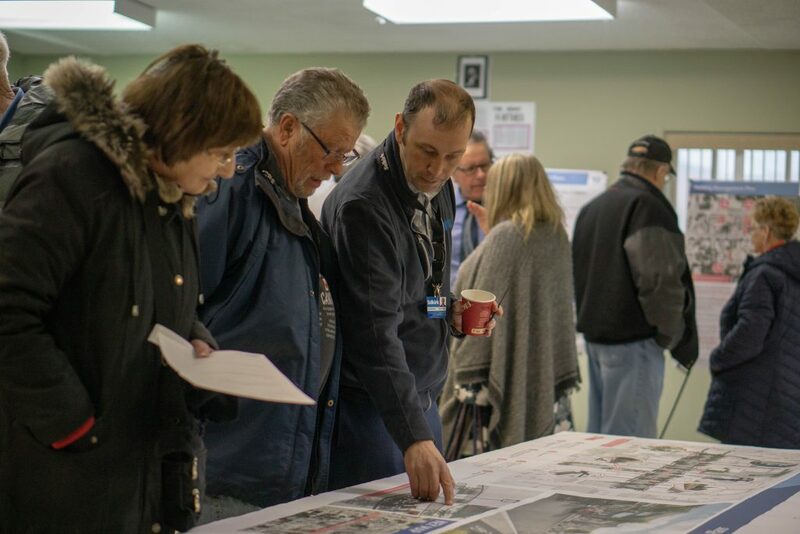 The city has engaged the public previously at open houses on downtown renewal including Manitoba Avenue East and worked with urban design and traffic engineer partners to create the concept that was on display at Thursday’s open house. About 200 people attended. There are significant changes planned for Manitoba Avenue East, all with the goal of creating a vibrant downtown area that is both vehicle and pedestrian friendly. Two of the biggest improvements will be Manitoba Avenue East will be converted from a one-way to a two-way street for vehicle traffic and angle parking will be replaced by parallel parking. As a one-way street, vehicles travelling on Manitoba Avenue East were all directed towards the Waterfront, limiting connectivity with Main Street and Manitoba Avenue West. As well, one-way traffic encourages higher traffic speeds, making it difficult for Manitoba Avenue East to be pedestrian friendly. Switching parking from angled to parallel will provide more space for pedestrians and cyclists. The design shared identified there would be about 42 parallel parking spaces on Manitoba Avenue East. There are currently 66 spots. But based on the feedback received at the open house, the city is working to increase the available parking in the area. “Parking is the number one concern we heard. Based on the feedback we’ve received, we’ll be making a few changes to the design to free up a few more on-street parking spaces and redesigning the parking lots to gain more spaces. In addition, we’ll be working with employers on the street to better manage the available spaces. A number of businesses identified that employees of the various offices and business are parking for long periods in customer parking. So, coming up with a parking management plan will make the parking we have more efficient,” said Nicol. Kelly Lewis, owner of Packers Women Fashion at the corner of Main and Manitoba, said as long as parking lots on Superior and Clandeboye Avenues have sufficient lighting and signage, they will be used. And she said increased lighting is key to making the avenue overall more welcoming to people who want to spend an evening out. “I think lighting will make the area safer because dark alleys and corners will be lit up and people will be more comfortable there,” she said. Lewis also applauded the city’s efforts to make Manitoba Avenue East a more pedestrian friendly zone to encourage walking. She loves the landscaping and the pocket parks and is thrilled that Manitoba Avenue East will be a two-way street. The new Manitoba Avenue East will include decorative paving and pedestrian scale lighting as well as active transportation infrastructure like an off-street bike lane. Planters and landscaping, space for public art along with the two pocket, or mini, parks will enhance the avenue. Selkirk resident Jean Jonasson was impressed with the redesign and more than a little anxious for change to occur. “I love the idea of all the benches that you can sit on, and the trees. It’s just going to be beautiful. You’d want to come down and walk down there now, that’s what I’d want to do in the summer now,” Jonasson said. This isn’t the first time that Manitoba Avenue East has been considered for revitalization. Bill Shead, Mayor of Selkirk, from 1980 to 1983 is thrilled about the upcoming project and hopes it can bring Manitoba Avenue East back to what it once was in the 80’s and earlier. “Pedestrian traffic owned the space in 1982. People wanted to walk down the street to get to their destinations and walked by businesses on the way there. They looked in the windows and walked in and out of shops – that’s what I would like to see happen again”. He notes that there are more residents than ever surrounding Manitoba Avenue East and less foot traffic than ever. The redevelopment of Manitoba Avenue East hits on almost all points in the city’s Strategic Plan, including Priority 1 – a vibrant, safe and healthy community, achieved through continued development of the city’s natural features and outdoor spaces and a revitalized downtown. Priority 2 of the Strategic Plan is a strong and stable local economy, which will be sustained by building on the city’s status as a regional service centre and building on Selkirk’s tourism potential.